While I have built two or three J-Head Mk V concept models, shown above is the first prototype. For the sake of comparision, above the prototype is a J-Head Mk IV-B. While it needs to be tested, I believe that there is a pretty good chance it will meet the 3 most important primary goals. The melt chamber is more than double the size of the melt chamber in the Mk IV-B. The orifice length will be kept to around 0.030". A special drill bit has been ground that creates a steeper taper at the nozzle orifice. This change is similar to other hot-ends that are available as a 118 degree drill bit is not ideal for a hot-end. I was able to fit the 5.6 ohm resistor in the Mk V prototype. However, if the 5.6 ohm resistor becomes unavailable, I will re-visit this decision. I decided to keep the thermistor mounting location the same, for now. Overall, I met 3 out of five goals. I changed my mind about 2 of them as the 5.6 ohm resistor is now plentiful and the thermistor mounting location is working fine. Of course, if testing fails, it's back to the drawing board. For the prototype, I only have 4 vents cut as I was concerned that the fifth vent location would be too close to the chuck in the CNC mill. This is not the case and I am planning to add the fifth vent back in. The original Mk IV prototype had 6 vents. 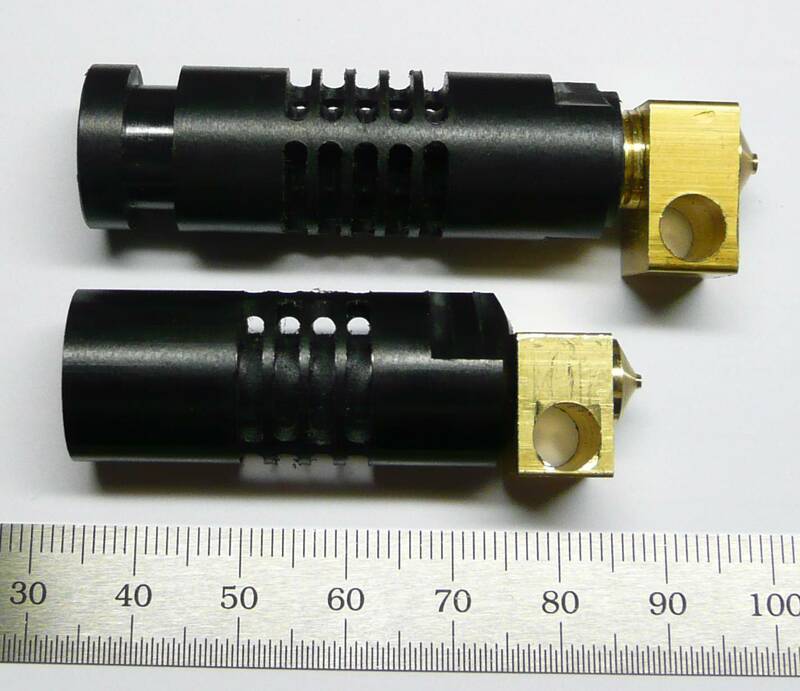 However, the 6th vent was too close to the chuck and created a serious machining issue as the chips would wrap around the chuck and damage the nozzle holder. The mounting groove hasn't been added as that is usually done on the turret lathe and, as long as the space is available, it wasn't necessary to machine at this time. In some cases, the mounting groove isn't added to the hot-end anyhow. On the left is the new nozzle. 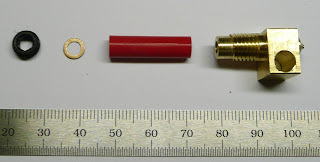 It uses a square piece of brass that is 13mm x 13mm. (Disregard the scratches as it was screwed into the nozzle holder on many occassions in order to test the proper fit.) On the right is the old version, used in the Mk IV-B and prevous hot-ends, that uses a 13mm x 16mm piece of brass stock. In the new nozzle, the threads are 5/16-24. The old nozzle used 3/8-24 threads. Since the thread size is smaller, the internal dimensions had to be changed considerably. However, the melt zone is the entire length of the nozzle. I decided not to use a smaller thread size, such as M6x1, so that there would be a greater mass of metal around the entire melt chamber. As the threaded section is now completely screwed into the PEEK, the bottom of the nozzle holder should double as insulation for the melt chamber. The first cooling vent starts almost precisely at the very top end of the nozzle. Here are the internal parts of the Mk V hot-end. Between the hollow set-screw is now a washer. This washer keeps the hollow set-screw from deforming the PTFE liner. I was considering adding the washer to the Mk IV-B. 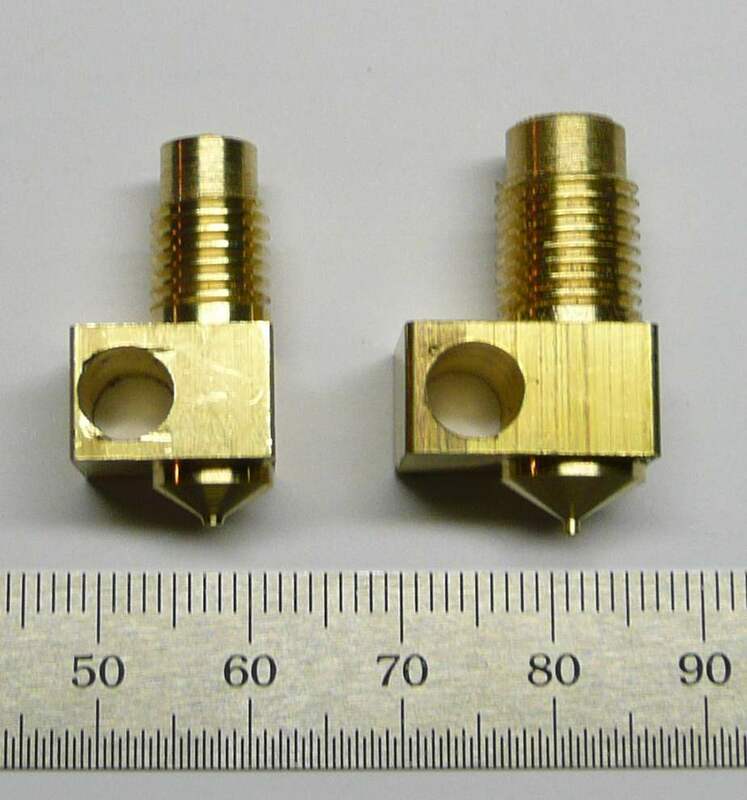 However, in the Mk IV-B, if you tighten the set-screw too tight, the taper at the hot-end will force the liner into the nozzle and cause a jam. The liner is now faced off flat and seats tight against the flat face of the brass nozzle. The result is that the set-screw can be tightened considerably. Since the nozzle has been machined out of 13mm x 13mm square brass stock, an aluminum nozzle is now feasible. I will probably keep the same naming convention. Therefore, the J-Head Mk V will be aluminum and the J-Head Mk V-B will be brass. New Aluminum Mounting Plates Have Arrived!